DON'S DNR are ZINC OXIDE non-linear resistors whose resistance changes as a function of the applied voltage. the DNR provides a highly reliable and economic way to protext against repeated hihg voltage transient and surges such as those produced by induced lightning surges, switching surges and noise spike. The DNR utilizes a ceramic element composed of Zinc Oxide and several kinds of metal oxide additives that have been sintered at relatively highly temperature. ohmic electrodes are connected to each end of element by firing. Surge protection in consumer electronics. Surge protection in industrial electronics. Surge protection in communication, measuring and controller electronics. Surge protection in electronic home appliances, gas and petroleum appliances. 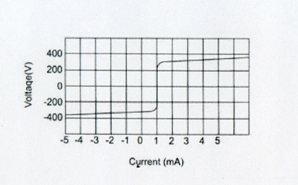 Electrostatic discharges and noise spike suppression. Relay and electromagnetic valve surge absorption. 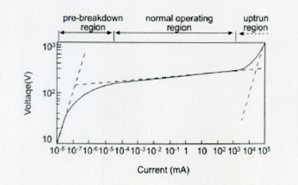 DNR had the forward-reverse symmetrical electrical characteristics shown in the Fig1.The curve is plotted for a wider range of current than that normally given in date sheet to show three regions in the Fig2.